Traffic congestion is roundly despised. Gridlock has few defenders. NYC’s mass transit system, the asserted beneficiary of revenues from the traffic fee, is riding a 25-year upswing and is understood to be the linchpin of the city’s prosperity. A broad coalition of business, labor and environmental groups supported and actively campaigned for congestion pricing. The demise of the pricing plan — it passed the City Council last week but wasn’t brought up for a vote in the State Legislature yesterday — is prompting much hand-wringing in the City. The New York Times today decried the powerful Speaker of the State Assembly for failing to throw his weight behind the proposal. The blogs, from the estimable Streetsblog ("covering the Livable Streets Movement") to the Times’ dot Earth, are asking what pricing’s defeat says about the fate of other, larger issues, from livable urban streets to the campaign to stop climate change. There’s soul-searching at the Carbon Tax Center as well. Having argued last year that congestion pricing and carbon taxing were thematically linked — both entail valuing the commons to preserve it; both appear income-regressive but can be made strongly progressive by fairly and effectively allocating the revenues — we’re obliged to ponder what the failure of congestion pricing portends for carbon taxes in America. pricing to climate protection, even in part, was disingenuous. 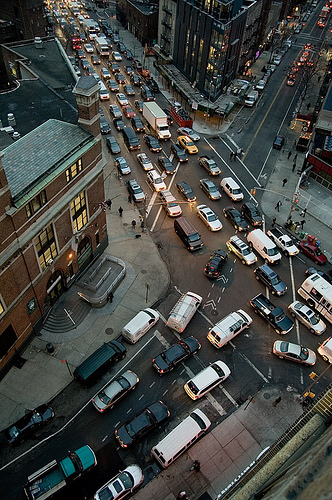 The anticipated traffic reductions would have eliminated no more than 1% of NYC’s CO2. The emphasis should have been on cutting the scourge of traffic, whose theft of time, sanity, and safety from New Yorkers outweighs the climate damage from CBD-bound tailpipes by a couple of orders of magnitude. The central problem policy problem, both here and around the world, continues to be that the losers from any policy change know who they are and are always far better organized than are the winners. Indeed, some winners are bamboozled into thinking that they will be losers. Nowhere is this more true than with congestion pricing — invariably this has been opposed by a majority before introduction but is warmly welcomed by a majority afterwards. This is why political leadership is so important. Such leadership emerges in New York only very rarely if ever and is one of the reasons New York continues to decline relative to other states. History tells us that this has long been true however; consider how T.R. got on the national ticket with McKinley in 1900. The amazing thing is that it went as far as it did in terms of being taken seriously — you and your colleagues should congratulate yourselves on that. After all the automobile is the holy icon of U.S. culture and the NY State Legislature has been notorious for being so ineffectual (how long did it take them to bring the divorcelaws into the 20th century?). So you at least had a very respectable showing and can try again. OK, readers, what do you think about the defeat of congestion pricing in New York and its implications for taxing carbon emissions? Please post. Our state legislators, like all lawmakers, follow; they do not lead. Their constituents – the general public – still refuse to pay the full costs of congestion, pollution, etc. in their energy and food bills, and in their consumption in general. It was ever thus in this country, even though Americans broadly support environmental laws and regulations. Most of them still haven’t made the connection, even though the CTC and many environmental leaders have struggled to educate them for decades. Today we have no leaders to articulate these connections, either in government or the media or even our communities. I have to struggle with the issue of full cost pricing with intelligent and progressive people. If I can’t persuade them, then how can we persuade the rest of the country? I recall early meetings of a climate coalition, around a table with thirty others, and I was the only one to state that cheap energy was at the root of the global warming issue. No one seemed to understand what I said. The deterioration of the environmental debate since the glorious 1970s and the first Earth Day is tragic and seems irreversible. I fear that we will have to await that 2 degree C. celsius tipping point before the public finally understands. And I wonder just what our educational institutions are teaching students nowadays to compensate for the after-school shopping sprees in the malls. And what are their parents teaching them? Everyone is in a state of denial or profound rationalization. We have regressed to pre-Earth Day times, in the country that took the lead in passing environmental laws, regulations and policies. We can’t blame Bush for everything. The growth/consumption disease has infected everyone. Remember Cassandra who was given the power of prediction along with the curse that no one would believe her. That is where we environmentalists stand today. Suppose it’s not about traffic? Not about taxes? Suppose it’s not a about a handful of tyrannical/arrogant/dysfunctional politicians? Suppose it’s not about an inadequate sales pitch? What if the problem is: the laws and constitutions and plans of governance and court dominance deny majorities the ability to govern our communities? My heart goes out to Earthlings relentlessly speaking truth about air and water and BTUs and toxic chemicals and wars and wealth privileges and rights denials all the terrible plagues that minorities of decisionmakers have inflicted upon people and the planet since In the Beginning. But today, in what for you and me are our 7th decades, Charlie, doesn’t experience compel us to ask if changes in law and policy that many people (and who knows how many — could be zillions) crave can actually come about under existing structures of law and governance? Can they be proposed, debated, fought-over, and written down in the shadow of our legally privileged institutions of cultural police? Our reality is: We Earthlings are denied authority and the means to make the laws that govern our own communities. Our towns, villages, cities, counties under law are mere administrative (and very subordinate) arms of our state legislature. State preemption is the rule. US Government kingly prerogatives make federal preemption an additional holy terror. Our state legislators have been putty under the thumbs of their two leaders for generations. They have little historical memory of what it might be like to represent human beings who are the source of all political authority in this land (and apparently, no stomach for same). All those public – private “authority” corporation directors who routinely make governing decisions are powerfully insulated from We the People. Exactly how much democratic self-governance is built into the City of New York? What self-governing authority exists in each borough? How big a fan of majority rule (aka democracy) is the mayor and the city council? (Like, what’s his attitude to the Critical Mass cycling protests?) How much do the leaders of the Big Green groups that loved CP like majority rule? So Charlie: is it possible to re-conceive and re-configure our work as humans as being about challenging — and undoing — the histories, cultures, laws, constitutional doctrines and inherited powers which have for so long disempowered the people of N Y State? It’s tempting to say: OK, Sure, Of Course…But THIS TIME, we’ve got the Billionaire Mayor and the NY Times Company and Data Galore and Blah Blah on our side…We don’t NEED to do all that labor-intensive human to human work. We don’t NEED great struggles by millions of people. We’ll use the structure of governance to get what we want — just like the corporate boys do. Paraphrasing Dr. Phil: How did THAT work out? We certainly bear the curse of Cassandra. Like you, Lorna, when I suggest that cheap oil is the root cause of the climate crisis, some cheerful person usually changes the subject to hybrid cars or recycling. The fact that congestion pricing got as far as it did suggests that consciousness may finally be shifting. As Charlie suggests, congestion pricing and carbon taxes are a fundamentally different approach: "pricing the commons" rather than the failed regulatory "bandaids"of the past. We have much work to do to create enough support for politicians to lead on these issues, and yes, we need to show that there will be winners (in this case, pretty much every business in Manhattan and many upstream in the suburbs) and build alliances with them. I feel Lorna’s pain. While prosecuting Superfund cases, I found myself waiting to copy a document proposing that EPA spend hundreds of millions to pump and treat contaminated groundwater to protect drinking water around Niagara Falls. Bored, I pulled a mis-collated document from the recycle bin. It said that EPA projected a 50% loss of fresh water supplies by mid-century in the Chesapeake watershed as global warming caused sea level rise and salt water intrusion. Striking Orwellian irony: EPA spending hundreds of millions to "clean up" groundwater in small sites while doing (and publicly saying) nothing to address the global threat. Past regulatory approaches pretend we can have our cake and eat it too. I’ve described the Clean Air Act’s mobile sources provisions (requiring catalytic converters, etc.) and CAFÉ (efficiency) standards as the "automobile addiction enabling acts." In the long run, cleaner and more efficient cars haven’t reduced pollution much or driving at all. I find myself noticing how often his question applies. At this point, the USA is acting like a heroin addict whose supplier is raising prices. Will we have to hock everything and crash into violent paroxysms before we start re-hab? This sums it up… you mistake education for wisdom. Go to the working-class people. Present them with "free public transit" … they don’t have enough "education" to be blind to the obvious. btw… Komanoff … keep up the good work. Charles:Glad you’re getting this conversation rolling. Juan Gonzalez’s column in the April, 9 Daily News — and he detests the congestion pricing scheme – makes the point (new to me) and I quote "The Bush administration has a long-range goal of ending federal support for mass transit and creating more private toll roads,, they say: What better way to support a movement for local governments to pay for their mass transportation than luring New York City with an offer of cash upfront? "Seems like a fair point, even though the Bushies will be gone soon. Fellow readers, what do you think? Now we take a few deep breaths and try for congestion pricing again next session. The economist writes "the losers from any policy change know who they are and are always far better organized than are the winners." Political scientists talk about policies with diffuse benefits and specific costs. Politically successful policies typically have specific benefits and diffuse costs — tax free pensions for government workers are an example. Incidentally, the specific cost to government workers, who drive at much more than other New Yorkers.